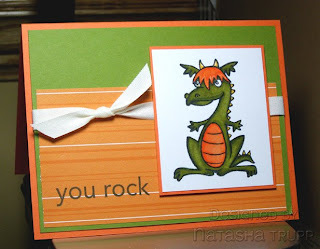 Here's a pretty quick card for you tonight. I received this paper this last year some time from a publication. 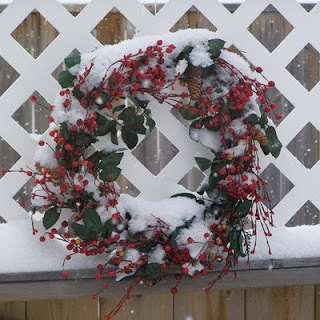 I hadn't used it because I believe I received it some time in the spring. Anyway, I "refound" it and was inspired. I thought it'd be fun to use a rub-on on some ribbon, so that's what I did. 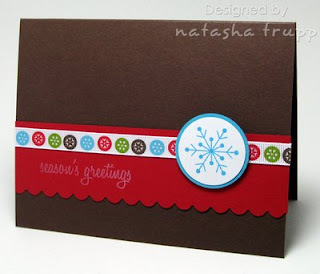 It's really very basic and I figured with paper as pretty as this, you might as well let it shine! 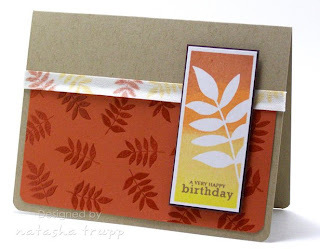 Here's a quick birthday card I made with some new-ish stamps that I haven't used to their full potential yet. I really love making a branchy scene and adding something slightly dimensional to it, like flowers, or birds, or these fabulous lanterns. There's not much else going on here, I was just having fun making that particular scene. 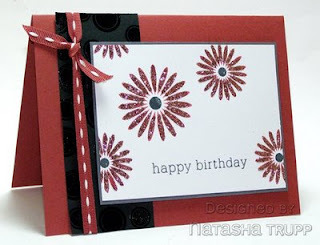 I added a birthday greeting and found a nice patterned paper that coordinated well enough. Here's a quick card I made last night. I really love the fancy label shape. I knew I wanted to set a flower in the shape, so that's what just what I did. First I chose the flower, then picked a size that worked well with my intentions (setting the flower off center to the bottom and still having room for a greeting). 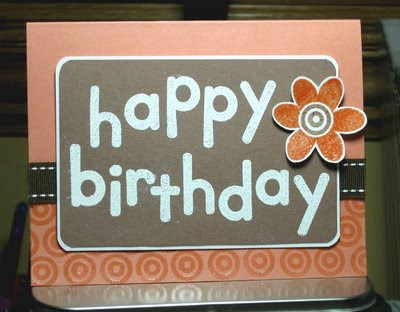 Once I had that, I had to decide what to do with the rest of the card. 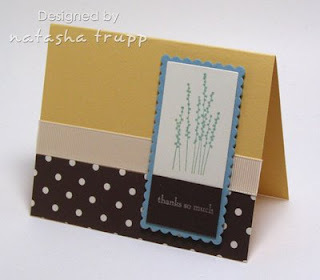 I decided to go with a simple scallops and white polka dots on brown. Ideally I would've liked to put lemon tart satin ribbon on here, but I don't have any, and I don't have the right colour Copic to match that lusciously lemon cardstock from PTI. Also, in case you're wondering, I'm kind of a bit crazy about having my layers being 1/8'' or under, and unfortunately these Nestabilities dies are more along the lines of 1/4'' apart, perhaps a bit more. If you're patient and a little crazy, like me, this is easily resolved by taking your one layer, adhering it to your next layer and cutting around the first one, leaving your fine mat. I guess I'm just used to cutting approximately 1/8'' mats around items of all shapes, so it's really become no big thing for me. In the meantime, we've been getting a bit of this stuff this week. So it actually looks (and feels) like Christmas. There's nothing quite like big fluffy snowflakes and temperatures that approach -30C. Although today it was actually quite nice out, it was -11 when I last checked. For this card, I had a bunch of ideas running through my head because I wanted to use at least 3 elements. 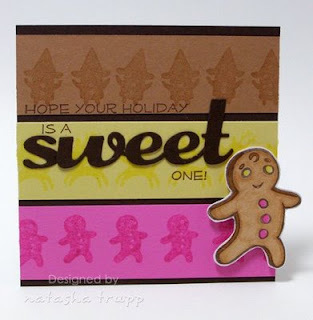 First off, I wanted to use the happy gingerbread man, secondly I wanted to make background strips with the silhouette images, and thirdly, I wanted to place a greeting somewhere, but I wanted it to really pop out. As is pretty typical for me lately, I started by colouring the main image, then found paper to match. I realized the colours I chose reminded me of Neapolitan taffy. And just like that, it came together. I stamped one silhouette image per coloured strip. Next I decided on the greeting "sweet". I decided that didn't quite cut it though, so I got out my stamp-a-ma-jig and place the rest of this holiday greeting around it. 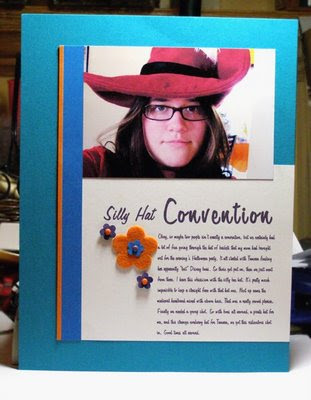 I have to say, this is not a typical "me" card, but I like how it turned out. It's just fun. 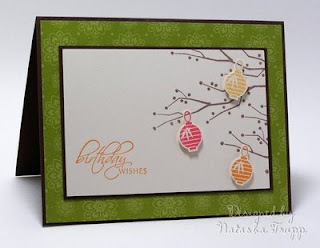 I uploaded these two cards to the Starving Artistamps gallery blog today so I thought I'd share them here as well. I know I tend to lean towards 2 colour palettes over everything else, brights and earth tones. 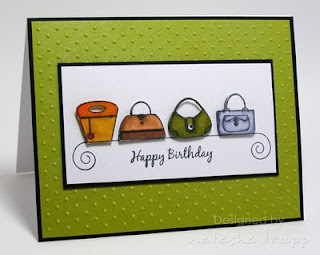 Well, with this stamp set, I just couldn't resist bringing on the brights in full force. They are just so cheerful! First up is my favorite polar bear. I had considered doing the white shading with the greys, but I had just done another card doing that, so I went with the icy light aqua. I decided to get really crazy and pair that with its retro complimentary colour- coral, and then I brought in a touch of olive (as if it wasn't feeling a retro enough vibe yet!). For this card, I knew based on past experience that PTI's Berry Sorbet and Sweet Blush were well matched to the coral Copics I coloured with. However, I knew it'd be difficult to find the perfect aqua. So I did the old standby. 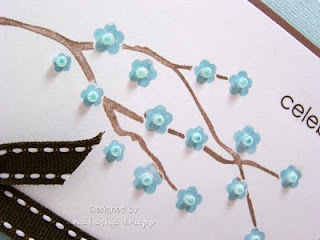 Cut out a piece of white cardstock with a nestability and then coloured just the edges with my aqua marker. I was even more certain that I would never find matching ribbon, so I cut a strip of 1/2 white satin and coloured that. It's interesting what alcohol based markers do fabric. 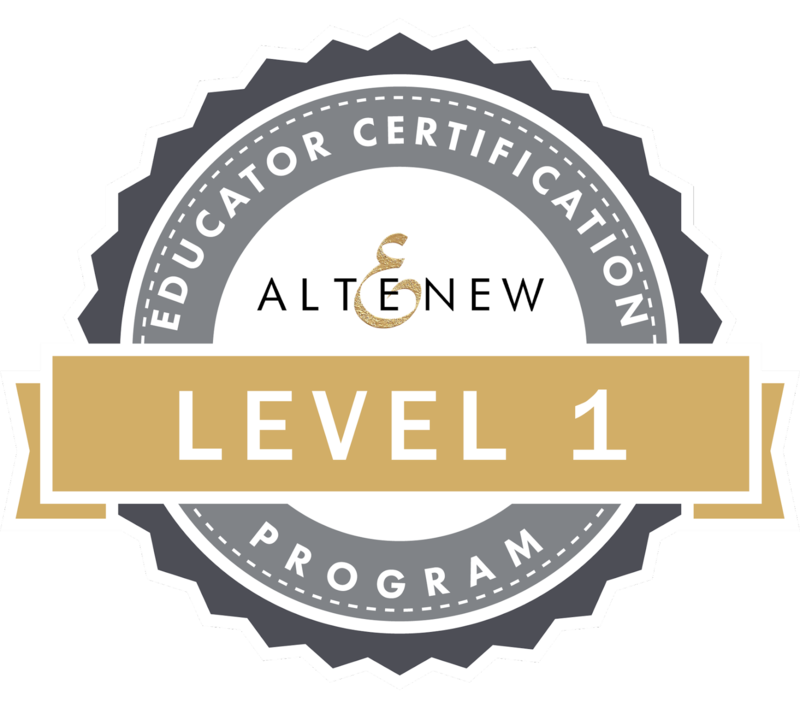 The ribbon still has its sheen and satin softness, but it becomes very stiff as the colour soaks in. This can be beneficial though, that knot is not going anywhere. 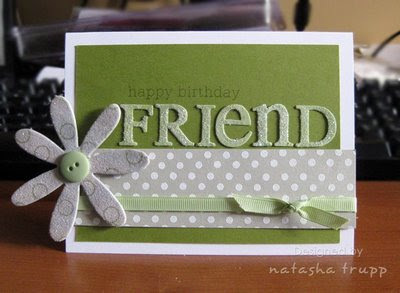 Next up is a simpler card (well less layers and no embellishments). I decided to make a scene using masking as my main technique. 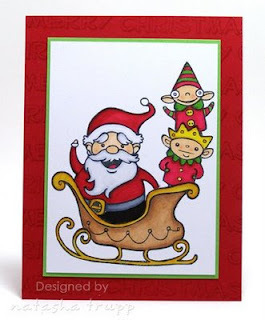 So first up I stamped the sleigh, then Santa, then the 2 elves. 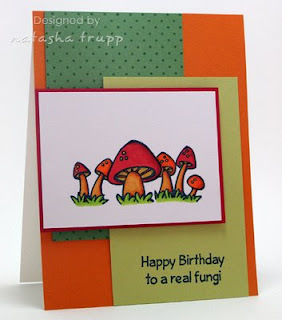 Once again the marker colours dictated the rest of the card's colour choices. I tend to do that, but hey it usually works out, so why not right? 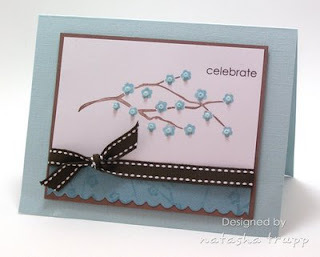 Anyway, the card is extremely basic, but I think the scallops, the polka dots, and the satin add a little something to an otherwise plain card. 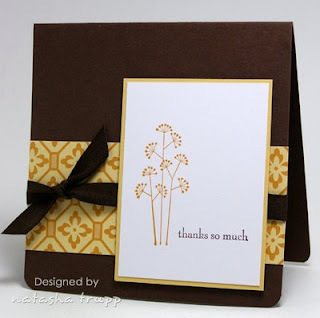 When I saw that fellow DD Alumni Taylor was starting to carry her own stamp line, I was more than happy to help support this new venture (especially once I saw how cute the images were!). 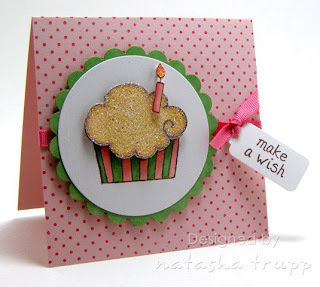 I threw together a fairly quick card using a few of the Coordinating Key Ingredients and this adorable image from Sweet Celebrations. 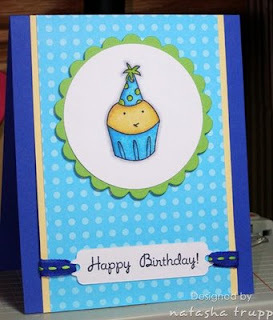 I thought that a vanilla cupcake would go nicely with the blue and green theme. I was really happy with how that turned out- Buttercup, Sand, and Pale Yellow are becoming one of my favorite Copic colour combos! 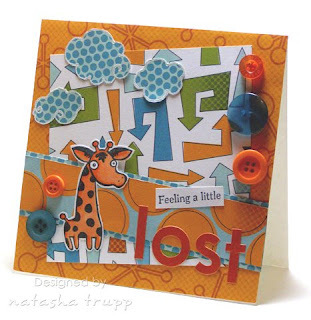 I wasn't really planning on posting twice today, but I spotted Kristina's colour inspiration and knew I needed to make a card. Sometimes you see a group of colours and, sorry to sound cheesy, it kind of speaks to you. This one definitely said AUTUMN loud and clear. 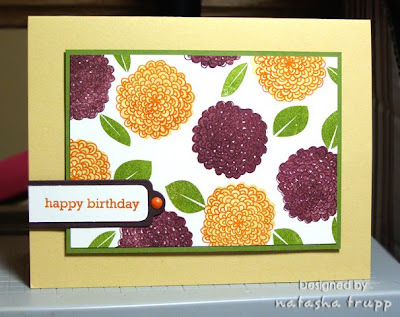 I thought about going with leaves, but I've been using my Garden of Life set so much today that I thought I would make a card focusing on a fall flower-chrysanthemums. We have pink ones in the backyard that are almost ready to open. 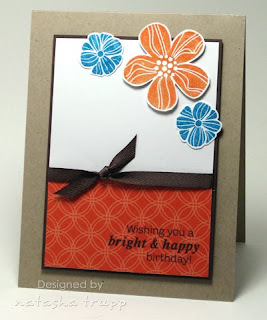 One thing I noticed with this colour combination is how ideally it works for 2-step stamping. I decided to make 2 types of 'mums. Burgundy base with a chocolate outline and saffron base with a pumpkin outline. 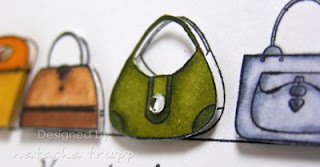 I added in bits of olive leaves for the 5th colour, doing all my image stamping on Vanilla paper. 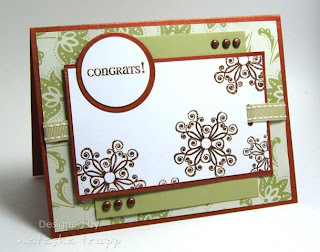 This was one of my submissions for the Star Stamper monthly contest at Papertrey Ink. 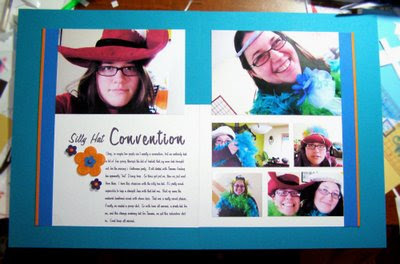 I had a lot of fun making it, since I rarely make such a large, matching ensemble. 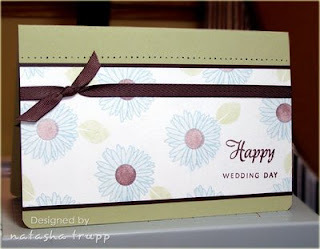 I started out with a place card, then a napkin ring, and a wine charm. 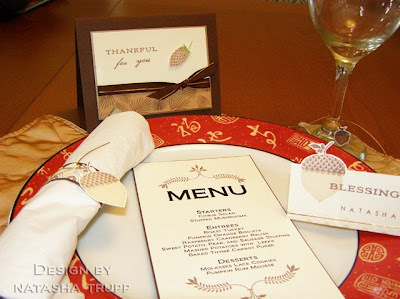 I really wanted a menu, so I looked up Thanksgiving Menu and found one I liked here . I looked through my fonts, and although I am not sure it's a definite match, I found one that was pretty darn close. Imagine my delight when I found something similar out of 1, 430 fonts! 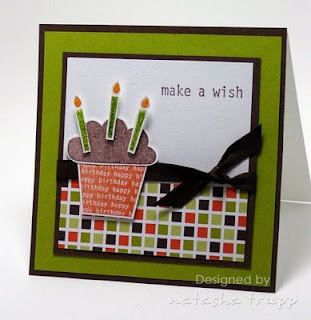 I thought I'd finish off the ensemble with a simple, yet sweet card- featuring one of my favorite layouts. I jazzed it up by tying the gold cord with the chocolate twill (this is terribly annoying to do, but looks stunning) and by cutting out and popping up the pine cone. Recently I picked up a few small bottles of Martha Stewart glitter. I am quite impressed with the colour selection and the fineness of the grains. 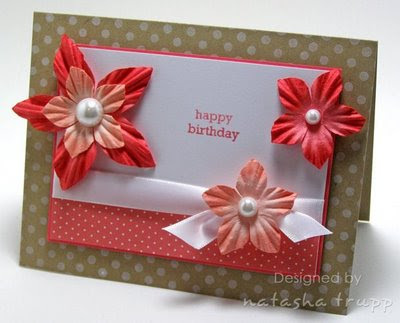 This card features Rose Quartz, which I thought went nicely with a black, grey, and cranberry theme. The glitter came in a pack of 3 and also with a small tube of glue. The glue is great, it has a very small opening, making control as easy as a marker. It doesn't goop or glob and it stays wet long enough to get a whole flower done! Other details: I had stamped the sentiment in grey first, but it just wasn't dark enough, so I went over it with a darker grey which ended up making a cool shadow effect! 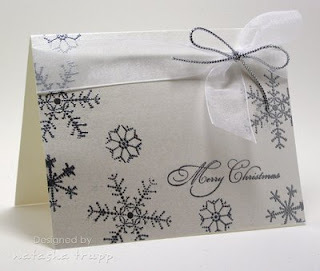 The black strip of paper has various dots embossed on it for added texture. 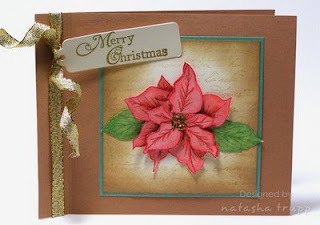 This is one of those cards that started out because I really wanted to add some glitter to one aspect of the image. I really wanted a sparkly moon an d some sparkly stars. 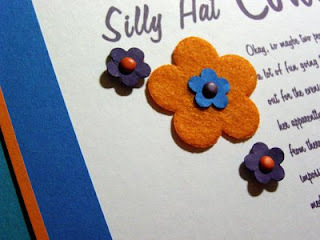 I coloured those with a yellow marker, then applied the glue and glitter. Next, I wanted a tent that fit into my mental image of what a tent should look like. For some reason, aqua and teal tones fit that image. I really love how the colouring turned out. 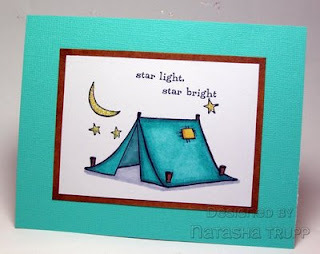 Now, the hardest part was finding cardstock that matched the tent. Luckily I found this textured piece of paper from Colorbok that matched nicely. 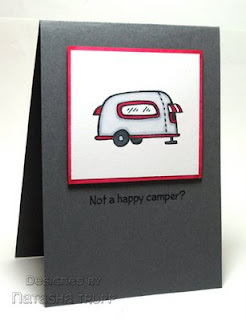 I absolutely love this adorable camper from the DoodleFactory Great Outdoors release. I thought it'd be cut to just feature the camper on a card. I went with semi-retro colour scheme: red, white, and grey. The red cardstock layer is actually a piece of white cardstock that I coloured with the same marker used on the trailer. 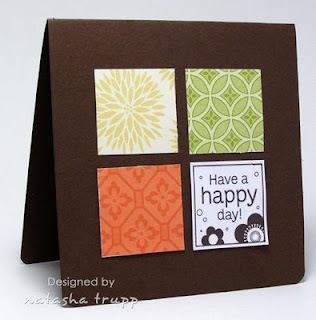 If all you are wanting is a thin mat that matches your coloured image, this is a good and quick method. 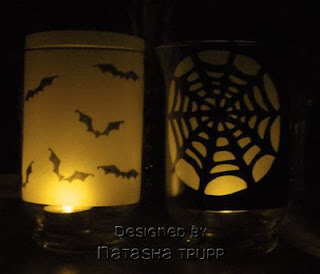 For years, I've been wanting to make these vellum lanterns. They are super easy, depending on how complex you choose to make it. The first one came together in less than 5 minutes. 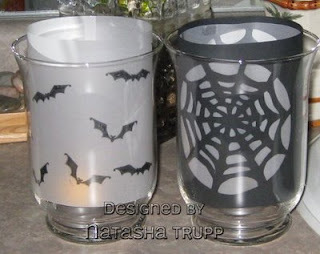 I stamped some bats onto a piece of vellum, taped it into a circle and fit it into my glass container. The next one was a bit more complicated. I found a spider web stencil, traced it onto some black cardstock, then started cutting with an x-acto knife. 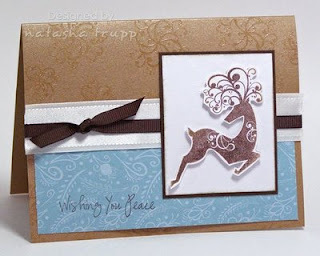 Next, I layered vellum behind it for a frostier look. Finally, I taped it into a circle and placed it into the container. This one probably took closer to 20 minutes to make. I used battery operated "tea lights", not actually ones, since obviously, paper is flamable. So this is what they look like with the lights on, and then I also had to post the spooky atmosphere picture. 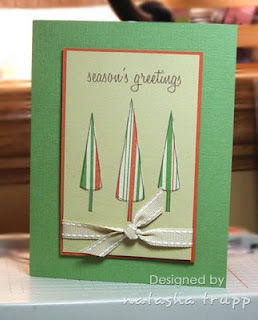 Here's another contender for the mass production of this year's Christmas cards. The colouring takes a bit of time, but it's not too bad, beats cutting stuff out! I wish you could see how sparkly this really is. 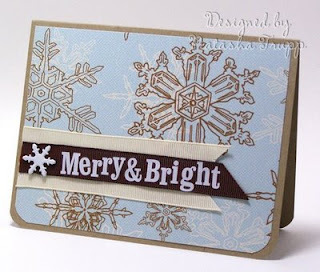 The card base is burgundy, sprayed with a Blue Russet shimmer spray. 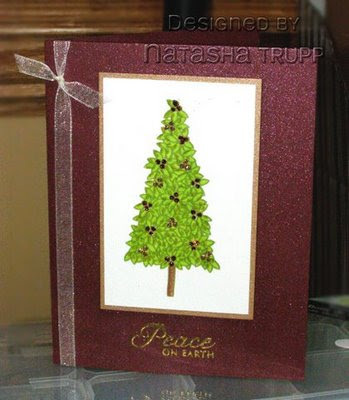 The tan layer is actual Mocha Metallic paper, and the tree itself is covered with little sparkle berries. I find that the touch of organdy ribbon also gives a nice shine to the whole thing. I embossed Peace on Earth, then had One Tin Soldier stuck in my head from then on... At least it's a pretty song, and I know most of the words, so it doesn't keep looping one little part. Yeah, it's a cheesy title... 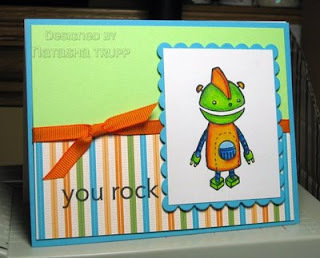 However I just LOVE using these robots with the "you rock" sentiment. 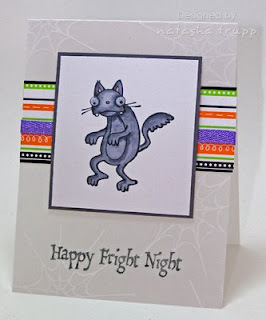 In general DoodleFactory news, have you seen the new Halloween release!?! These are adorable. I'm thinking they may be my favorite yet! There's also some other fun new stuff over at Starving Artistamps- some nice new backgrounds as well as some entertaining witches. 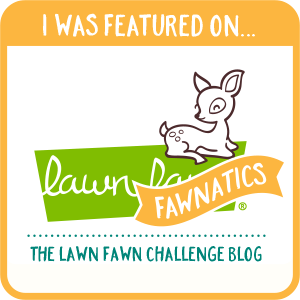 If you're interested in winning some new stamps, you may want to go here. Anyway, here's my robot card. 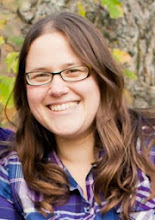 When I saw that Peggy at PaperWorks Co. was starting a stamp line, I was super excited for her. She's one of the nicest people I've never met :D. By that I mean in person of course, we have chatted back and forth through the occasional email. So, onto the stamps, so far there are a few Safari Friends. 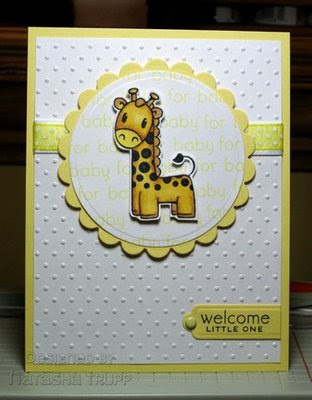 I love giraffes, so I had to use Gordie right away. In case you're wondering, the stamps are rubber,die-cut, ez-mounted, and ready to go. Very nice quality. 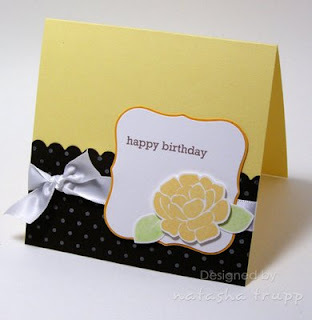 For my card, I stamped Gordie in Tuxedo Black, then coloured him in with Copics, I used E33Sand and Y21Buttercup, and a bit of Y11 Pale Yellow to blend. 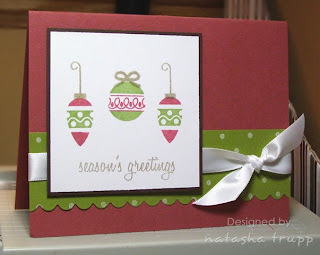 I cut that out, mounted it over a stamped background.